Below is the history and present state of the "Obelisk of Forgotten Memory", a 30 "room" adventure location that my players ran through a month or two ago. If there's interest I will cobble my notes, maps, tables and art together into a PDF. The Obelisk grounds contain a Ghoul Gang, Cult Frankensteins, a Cannibal Ghost, Fighting Funerary Deities and a Crypt of the Rocketmen. I will post more bits and piece under the header "Obelisk" in the coming weeks. This location was built by the ancients, at least the major feature of it was. 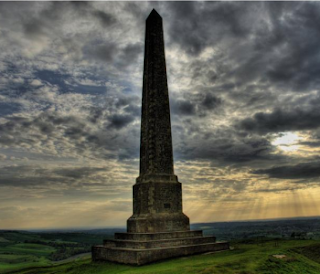 The Obelisk itself dates back over 3,000 years (3,462 to be exact) and was originally part of a large war memorial cemetery and park, including a visitor's center, numerous crypts and several smaller obelisks. Within a hundred years of its founding the obelisk became an unpopular destination, due to the uncanny psychic emanations of legions of ancient war, and fell into decay. Long before the fall the Obelisk park was a largely forgotten location, notable largely as a landmark and only visited by a few fanatic patriots, bored relatives and seekers of the bizarre. When the fall occurred the forests had already retaken entire regiments of forgotten war graves and only the central parkland around the obelisk was in decent repair. The obelisk itself, being a 1000' tall needle of indestructible Protonium, remained a focal point, but the cemetery was abandoned. The memorial grounds were rebuilt in several stages with most of the building only three hundred years ago during a time of relative stability when a wizard/warlord named “Torpo the Cannibal” ruled the area south of Denethix. He planned to turn the area into a memorial park for himself and his family, and his body (and spirit) are now entombed in the Sepulcher complex his slaves built from greenish marble. Torpo's line did not endure long after his death, and his bloody legacy was enough to provide his necropolis with an additional evil reputation. Since Torpo's death the obelisk has been used as a place for the burial/disposal of the bodies of those who are deemed likely to haunt the living or rise again. For most of these dead the fear of reanimation is just superstition, but the rare few corpses that do transform are often brought to the obelisk. Because of these rare undead, three funerary gods have ordered representatives of their priesthoods to protect the Obelisk grounds and put down any dead who rise. In former times many more priests, gravediggers, guards, morticians and even hired mourners lived on the obelisk grounds, but since the rise of Denethix the number had fallen. The three funerary gods: Bezonaught, Delphina and Bonechewer Jackal-mask all had some priestly representation at the obelisk until very recently. One element not known by modern visitors to the Obelisk is that it's original builders tethered the location to a geosynchronous beacon that allowed the memorial complex to broadcast its presence into space. The original broadcast was a computerized voice reading a list of the millions of dead inscribed on the memorial and buried in the surrounding cemeteries. The beacon is still operational, but the computers that maintained the list of ancient war dead have long since failed. The fixed orbit of the beacon makes the memorial grounds attractive to orbital gods as they can address their followers at any time of day by rebroadcasting through the beacon to nearby God's Eyes. The connection to the beacon is limited to one deity at a time, and if the location were more prestigious it's likely there would be considerably more divine conflict to monopolize it. Nine months ago things went wrong at the Obelisk. A group of fanatic priests devoted to an unorthodox orbital god moved onto the Obelisk Grounds and seized it hoping to turn the backwater holy spot into a major site devoted almost exclusively to their god. This sort of thing happens routinely amongst the the orbital gods out in the wilderness, but it is unusual that the fanatics within the Obelisk Grounds have tried to drive other deities out of holy site that they have occupied for thousands of years and reserve the beacon's use solely for their god. The cultists worship Furter of the Walking Corpse, also known as King of Boogeymen. Furter's divine portfolio includes: Zombies, Mechanical/Alchemical Necromancy, and the Forgotten Dead (explaining a less sinister interest in the Obelisk). He is known to his followers as “The Remeberator” and his detractors as the “Reanimator”. Furter isn't actually a bad god as they go, but he's called his most stupidly loyal followers together for his attempt to take over the Obelisk and it's geosynchron beacon. Furter is ambitious and rightly feels that the current trio of funeral gods have gotten lax about the Obelisk's upkeep and importance. The cultists swept into the grounds in force and chased off most of the gravediggers in the temple, as well as the priest of Bonechewer and his small force of guardsman. They slew the neophyte priestess of Bezonaught (who has trouble finding good help), the hedge-wizard groundskeeper, several gravediggers and the few guardsmen who refused to leave or fought back. The elderly priest of Delphina collapsed from a heart attack in all the excitement and was interned respectfully by the cultists, who were upset they had to kill anyone, especially a priestess. After driving off the living, the cultists began to take over the memorial park, setting up a reanimation lab and preparing to make a zombie and skeleton guard force. They began plundering the crypts above ground for fresh material and digging up graves for spare parts and valuables. Both Bezonaught and Bonechewer responded with anger at the murders and desecration. Bezonaught is angry the cultists killed his priestess, though mostly he just likes making horrors. Jackal-mask wishes to drive the cultists off and protect the graves of the dead from looting, though he has chosen to accomplish this with destructive methods. Both funeral gods have been fairly successful at thwarting Furter's cultists, but they won't cooperate and their forces (ghouls and corpse fleas) aren't the most reliable. The funeral gods have largely succeeded in keeping the cultists barricaded in the main crypt complex while corpse fleas and ghouls roam the graveyard, skirmishing with each-other and trying to pick off any cultists who emerge, especially at night. The Obelisk grounds contain three loose factions in addition to assorted restless spirits (who arguably serve Delphina): the Cultists of Furter, Bonechewer Jackal-mask's Corpse Flea Colony and the Ghouls of Bezonaught the Boogeyking. All are mutually hostile to a greater or lesser degree, and unless the PCs join one god or another they will be equally hostile to the PCs. The graveyard has a strange ecology, as all three factions require corpses to strengthen themselves, especially those of the freshly dead. The cultists are slowly animating a legion of zombies and skeletons using galvanism, soul-clockworks and other hokey 'super-science' sacred to Furter, but have been forced to divert most of their energies to consolidating the temple against unaligned undead, corpse fleas and the ghouls. The ghouls and corpse fleas feed on bones and corpses that they gather from the graveyard or ossuiaries, but need the freshly dead to increase their numbers if they wish to dominate the grounds. If nothing happens the cultists will eventually create enough zombies to overwhelm the ghouls and corpse-fleas, but that is still several months off and right now they are barely holding their own. The arrival of the PCs, Bonechewer's vengeful priest, cult reinforcements, bandits or other interested parties are all likely to upset the balance one way or another. Well I am fond of encouragement - I'll trickle it out over the next few weeks while I finish typing up some of the areas. I'm looking forward to the PDF of this! Now you can track my progress with this handy page! Also the next three play reports (including today's)are from a play through the Obelisk - though they didn't hit a lot of the content. As you can see there is plenty to do.